When I try to import a custom indicator zip file, I get the following error: "You have custom NinjaScript files on your PC that have programming errors. These errors must be resolved before you can import a NinjaScript Archive File." When I go to Tools to select Edit NinjaScript to compile, that option is not there for me. Can you help me get that feature? 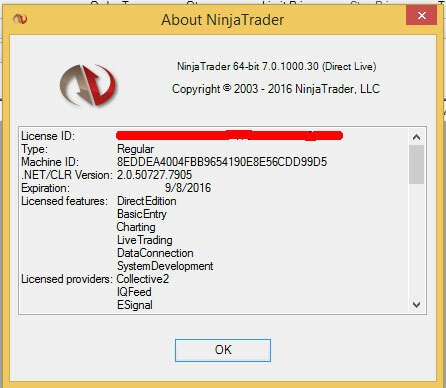 I just installed the latest version of NInjaTrader, but that didn't fix anything. Last edited by shaneaw; 01-10-2016, 01:42 PM. Please redo your post, blanking out your license key. You do not want anyone else using it because it would look like you are logging in simultaneously from 2 computers and violating your NT license. Last edited by koganam; 01-10-2016, 02:24 PM. Reason: Deleted sensitive info. Thanks, but you quoted my original post, so can you please edit yours now to remove it from there as well? My mistake. I apologize for routinely quoting the original message in my response. If you are unsure as to what the error is indicating, please send me a screenshot of the error with the name and description fields clearly readable. When I go to Tools to select Edit NinjaScript to compile, that option is not there for me. That is the reason I created this thread. Can you help me get that feature? Please contact me by email at PlatformSupport [AT] NinjaTrader [DOT] com. In the message please include a link to this forum thread and a copy of your license key. You will find the key in the Help > License Key menu. Email sent with licence key included as per post #8. Hi..... I have the following error can you help ? "you have the custom Ninjascript files on your PC that have programming errors. These errors must be resolved before you can import a ninjascript archive file." Your "references" are defective. Before we can tell you how or why, we shall have to see the entire error message that is in that picture. The message seems to be pretty clear. Did you perchance relocate your "Documents" folder? Are you logged on as user Rob? Have you maybe deleted the referenced files? Check and be sure that the files are at the referenced location. what do i need to do to rectify this ?